There are marked differences in the clothes worn by Saxon and Viking women. This guide aims to provide an overview on what you will need for the basic outfit worn by a typical Saxon or Viking woman living around 800-1000AD. It does not tell you how to make the clothes, but includes links to pages that do. The best book for people interested in Viking clothing is Thor Ewing's Viking Clothing, whilst Mark Harrison's Viking Hersir 793-1066 AD has lots of useful pictures and is a good book to take to markets when buying weapons. 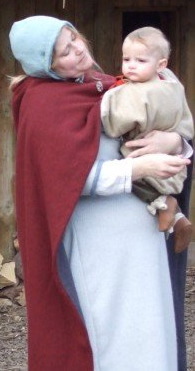 Gale Owen-Crocker's Dress in Anglo-Saxon England is great for Saxons. This covers the basic dress worn by both Anglo-saxon and Viking women. The following sections go into the specific aspects of each culture. Whether you're a Saxon or a Viking, you will need an ankle-length underdress of linen. Underclothes were normally undyed linen - after all, this was probably the one item of clothing that got washed with any degree of regularity. The sleeves should be relatively full with narrower or tight cuffs. In some areas, e.g. East Anglia, you can fasten a full sleeve around your wrist with wrist clasps instead of narrowing it at the cuff. The neck of the underdress can be cut as an oval, a keyhole fastened with a brooch or tie, or can even have a drawstring. Over this a woman would wear a full-length linen or woollen kirtle, cut from a similar pattern to the underdress with an oval or keyhole neckline. As dress patterns most likely consisted entirely of squares, rectangles and triangles, there is little option for tailoring. Dress patterns can be found here. The wrists, neck and hem of the kirtle can be decorated (according to your wealth and status) with contrasting-coloured fabric, tablet-woven braid or embroidery. Wynflaed's kirtle, shown on the right, is linen with tablet woven trim. It has a very full skirt, achieved by adding triangular gores. This is fairly simple - don't wear any! In other words, there is very little evidence for, or consensus on, what women may have worn under their dresses. A pair of knee-length linen breeches will stop any unwanted draughts, but may not be authentic. There is, however, evidence that women wore strips of cloth (winningas or puttees) wound round their lower legs and fastened at the knee with a bow brooch. This latter is essentially a dark-age safety pin. Authentic shoes are very important, and the lack of shoes can really let down an otherwise brilliant set of kit. It seems there were no specific styles for men or women, so you can wear whatever type of shoe you like. Re-enactment markets are recommended over buying shoes on-line, as it's always best to try them on yourself. Lining your shoes with sheepskin will keep your feet nice and warm. Many Wychwooders just wear normal socks (thick woollen ones in brown or another dull colour can pass reasonably well), but a more authentic way of making socks is nalbinding. Women did not appear to wear leather belts with metal fittings. Instead, they would presumably have worn a tablet-woven belt. This should be long enough to knot around your waist and leave the ends dangling. The ends can be finished off with tassels or beads. Your belt can be used to carry important items such as your pouch, needle case or knife. The woman of the house would also carry keys on her belt. The keys to the house, and to the coffers containing money, were definitely women's property in this period and carrying them could be something of a status symbol. An Anglo-Saxon in the period we re-enact would almost certainly be a Christian, and in this period Christian women covered their hair. This is most simply achieved by wearing a simple cap or coif, like Eowyn is wearing in the picture on the left (baby accessory optional). When going out or dressed in your best clothes, you can add a wimple. Underneath the cap or wimple, women would plait their hair and pin it up in a bun. Your wealth and status would be displayed not only by the fabrics you wore, but also by your jewellery. Torcs, pendants, rings and brooches can all be worn. See the page on bling for more info on jewellery. You should note that some styles of brooch are highly period- or region-specific, like the aforementioned East Anglian wrist clasps. Wychwooder Shelagh Lewins has written an awesome description of a reconstructed Saxon woman's outfit that she is making, with lots of detail about the style of the clothes, the material used and the provenanance of her designs. Viking women wore a hangerok over their kirtle. This is a simple tube of fabric, suspended from your shoulders by two straps of fabric or braid. Two large tortoise brooches were used to pin the front ends of the straps to the front of the hangerok. Between these could be suspended strings of beads. Small accessories such as tweezers, snips or needle cases could be suspended from the brooches rather than being hung from the belt. Ingibjorg, in the picture on the right, has an impressive pair of tortoise brooches and a nice collection of associated bling. Pagan Viking women may have covered their hair with a cap or knotted cloth when they married. This PDF by Mistress Barbara Atte Dragon is also useful and includes dress patterns. This PDF has lots of hangerok designs from different regions and periods. Woolen cloaks were popular with all Germanic peoples, and were often commented by outsiders from the time of Tacticus right up to ibn Fadlan. Standard feldr cloaks (rectangles 160 to 300 cms long by 80 to 160 cms wide, wrapped round body & pinned at right or left shoulder) were worn by everyone, whilst semi-circular cloaks, hooded cloaks and poncho-style cloaks seem to have not been worn by normal Saxons (but were worn by many Vikings). Viking women in the 9th Century might wear a long-sleeved coat or kaftan in place of a cloak. You can keep your head warm in cold weather by wearing a hood. Like a free man, a free woman in Anglo-Saxon England had the right to carry a knife. You could add a short seax in a leather scabbard to your belt. This would most likely be used as a tool rather than a weapon.